The one and only, Antarctica Flights, is celebrating 25 years of fulfilling the bucket list dreams of over 40,000 guests since their first charter in 1994. With each new season comes new sights to behold. Agents all over Australia looking to surprise and delight clients can now offer this truly unique experience with flights scheduled to depart from every corner of the country. The 25th season of Antarctica Flights will commence on 18 November 2018 departing from Sydney, and for the first time ever, an Antarctica Flight will be available from Hobart on 25 November 2018. The ever-popular New Year’s Eve Antarctica Flight ex Melbourne will be making a return, perfectly positioning passengers over the icy continent right in time to ring in the New Year while witnessing glaciers, icebergs and lunar landscapes, as the sound of a four piece jazz band plays live in the cabin. With additional flights from Brisbane, Adelaide and Perth scheduled for the 2018-19 season. This unique experience is the only way to visit Antarctica from Australia and the only ‘flightseeing’ tour in the world to explore the region. With Antarctica Flights, guests reach the continent in just four hours aboard a privately chartered Qantas 747—and are back in time to sleep in their own bed that same night. No two flights are the same, with up to 19 weather dependent routes, there’s no wonder this is every pilot’s favourite flight to command. 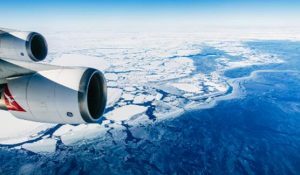 With up to 4 hours viewing time over the ice paired with Qantas’ full international flight service, commentary from the cockpit and Antarctica experts hosting the flight, it’s certainly a special treat for adventurers young and young at heart. Take in the sights as the plane descends to as low as 10,000 ft and swoops in figure 8 patterns to maximize viewing opportunities of research bases, mountainous peaks and colossal icebergs below. “The length of time sailing rough seas and cost of a cruise to Antarctica means the closest most people will ever come to seeing the world’s last great wilderness is via their TV screen. 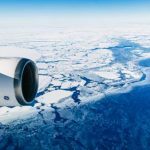 Our one day sightseeing flights enable more people to fulfil a lifelong dream of seeing Antarctica.” explained Phil Asker, Founder of Antarctica Flights. With a range of seat classes available to suit all budgets, an Antarctica experience is a must for your curious and adventurous clients.